fastbilly 1, you figured that out quick! I will start a new topic to go over everything from the different screenshots. I’m sending them on to Ron McAdams for 3D scanning so perhaps we can finally start getting to the business of properly Waverly-izing them. Before we cross that bridge though, I thought we might explore these off-the-shelf toys to get a better idea of how they’re alike and also different from their final, 3D modeled counterparts. Before we get into each individual part, I thought I’d share what I was able to learn about the sizes and scales of the real Waverly and how I came to my conclusions. 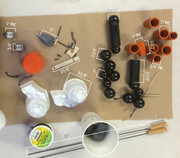 I think we’re all familiar with the photo posted by PuppetGarage of Waverly’s bits all spread out before being assembled. The Scale-Unlocking-Key they benevolently gave us, came in the form of a paint-cap which was then ID’d as coming from a Krylon spray can. Since that is something we can easily acquire and determine the size of, we now have a scale system we can use to measure the rest of the items in the photo- At least all the items that are laying at relatively the same elevation as the base of the Krylon cap. Which is to say, table level. 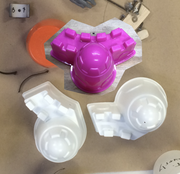 Incidentally, I discovered the Basement Bot part that makes up the shoulders also has a diameter around the base of its conical castle tower of exactly 2-5/8” as well… Which we’ll get more into further on. The next image features the results of the objects I felt could be most accurately measured, being closest to the table surface. Note: I found the diameters of the orange “arm links” to be consistent with the Outer Diameters of 1” and ¾” PVC pipes. That’s why I identify them as such, instead of by their exact ODs. The community is of course free to debate me on that. But I still have more to share on that further below. What about the parts we can’t accurately scale our ruler to since they are at a higher elevation from the table? Like the assembled head, the pump-body, etc? Unfortunately, when we take into consideration the fact that there’s no way to know exactly what kind of lens is being used and how that’s distorting the perspective (not to mention the distance from camera to subject), we simply can’t get technical and call it confirmed. But what we can do is attempt to see “in general” if our suspicions are correct that both the foot-pump body and watering can head were indeed enlarged for the final puppet. Again, I took a photo of all three parts in matching positions as close to what we see in the PuppetGarage photo as I could get them. We add in our control object, the paint cap, and then we can scale the new photo to match the old and see if the objects are dramatically different from each other or not. Again, this isn’t as accurate as the table-top ruler method, but I think it helps give us a basic idea if the sizes have been altered or not. Low and behold, we see what that gives us when we put each object side-by-side with their Waverly counterparts. I personally think the differences in the head and body are dramatically different. I’d say they were indeed scaled. Especially since it looks to my eyes like the shoulder castle does NOT appear to be dramatically different in size using this comparison method. By how much more did they scale-up the head and body? I’m afraid there’s no way to accurately pinpoint that just by this photo comparison. That will come down to 3D modeling against Waverly photos based on the known size of his “belt buckle” which Ron was able to put a ruler next to. First up, a word of caution to anyone looking to hunt down the Air Hogs rockets- This version, the “Split Shot Rocket,” which I saw discussed in the thread AND which features a correctly shaped foot-pump pedal PRINTED on the front of the box… Is a LIE! The accurate pump features the correct number of ribs, a properly shaped base, and (once cut from the tube leading to the rocket launcher) the cylindrical air spout at the bottom-rear. One new discovery (as far as I’ve seen in the thread) is that the base and pump body are two individual pieces which can be separated from each other. So how does the final, printed Waverly body stack up against the Foot Pump? An obvious difference is that the 3D printed version has flattened out the top and removed the raised edges found on the toy. The other change is that the very bottom lip which makes up the top of the removable base on the toy has been instead been modeled onto the body. Here’s the thing- I still think the Black painted base of Waverly is a separate piece, possibly attached with some small screws. At least that’s how I would make it. Both for ease in painting and for access into the pump/body for assembly, repair & replacement. One thing that’s for sure, the Waverly version doesn’t feature the raised-ridges found on the bottom of the toy’s base and instead the black base looks completely smooth. The sand toy watering can that makes up his noggin’ has several differences as well. First, the cap that is removed from the spout and placed on the “top” has an extra circle of watering-holes on the toy version. The Waverly puppet only features one with a single hole in the center. The same number of ribs are present on both objects but it appears that the very top rib, while still larger than the others on the final Waverly, has been reduced or shortened compared to how it appears on the toy. The other big takeaway is the length of the stem on the “Eye spout.” Every angle I’ve seen in photos of Waverly have me convinced that not only is it a separately modeled and printed piece from the ribbed “Can Head” it’s also set further back into the head. Thus, the stalk doesn’t stick out as far as it does on the toy. It should be noted both watering can and spout are all one, single piece of injection molded plastic on the toy watering can. 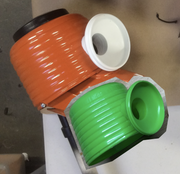 Lastly, the outer edge of the spout-eye has a ringed “rim,” which was used for keeping the yellow spout cap on. It looks like it’s thicker and more pronounced on the final puppet. Now that we come to the shoulders, I have to admit I thought for certain that these were also scaled and altered in several dimensions. Instead, after photo-scale comparisons I’m actually convinced these are the only parts that (as far as scale is concerned) weren’t altered! Or if they were, not by very much. One small detail that differs between them is a short ridge at the baseline on the toy that isn’t present on the Waverly puppet version. The final LARGE difference has already been observed and discussed at length in this thread- That is the alteration of the toy’s body to only have one castle wall outcropping protruding from its side. This can be easily seen in any view of the piece from above. No dice. Again, based on the reviews which state receiving the same mold I did, I’m willing to bet the seller does not even have the yellow castle tower anymore. If you’re one of the lucky folks who do have one these parts- PLEASE consider submitting it to Ron McAdams for 3D scanning. He’ll send it back to you and you’ll be making so many others very happy! I suspect the piece has been altered on the Waverly puppet both in scale and changed to be more ovular in its circumference… But I can’t say for certain having never had an original in my hands. Ron, I have a close replica if you cant get in touch with Dan who spent who knows how much on getting a 1:1. I need to take apart my Waverly to fix his mechanics anyway. Things have been a bit crazy on my end, but I definitely still have a mouth that's the right sculpt but too big. It's been cut/painted Waverly colors, but if that's not a problem, I'd definitely be down for getting it scanned! Since the files will be scaled to large should not be a problem. And cut might actually be better, I have never had luck cutting a 3d printed model. That would be fantastic if you can send even that half piece to Ron! The 3D scans will only serve as a labor-saving starting point on the parts anyway. I was actually doing a photo-layered comparison today to a picture you posted of your halved, green mouth piece over a similar profile photo of Waverly. It’s definitely been manipulated from the original. The lengths of the square and round extrusions are different on the final and the top part of the “beak” has been modeled to be slightly wider than the bottom just as I suspected. Manipulating those changes on a scanned model that we can quickly align to the X,Y,Z axes will be easier than trying to model one anew from photos that don’t give us perfect profile angles to work from. Been slowly teaching myself Blender in anticipation of working on the 3D scanned parts... Mostly because I don't have CAD and Blender's free.